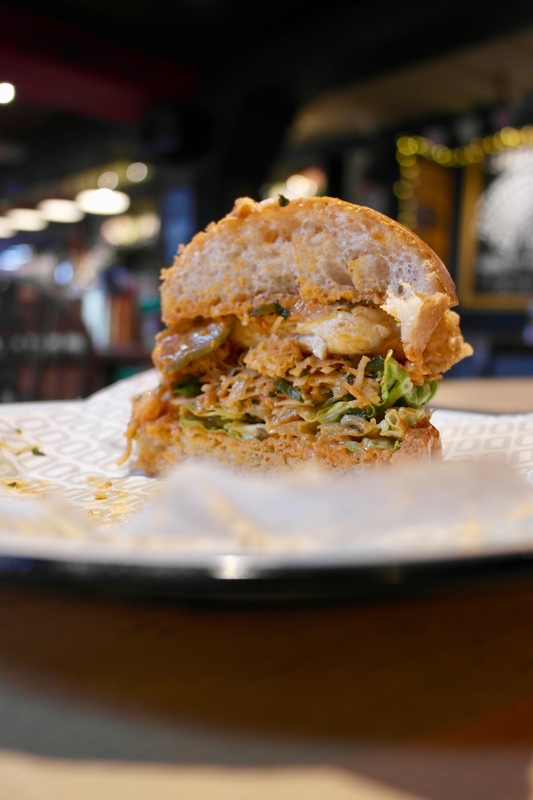 With Veganuary in full swing, The Rusty Bicycle invited Bitten along to sample two new vegan dishes – a tofu burger and a vegan pizza. Full disclosure, I’m an omnivore. You may have read in previous posts I’m gradually reducing our meat consumption as a family. So this little meat eater went along happily, intrigued to see if I’d miss cheese on the pizza and meat between the buns. First up was the ‘Tofu or not Tofu’ burger (£9.50). 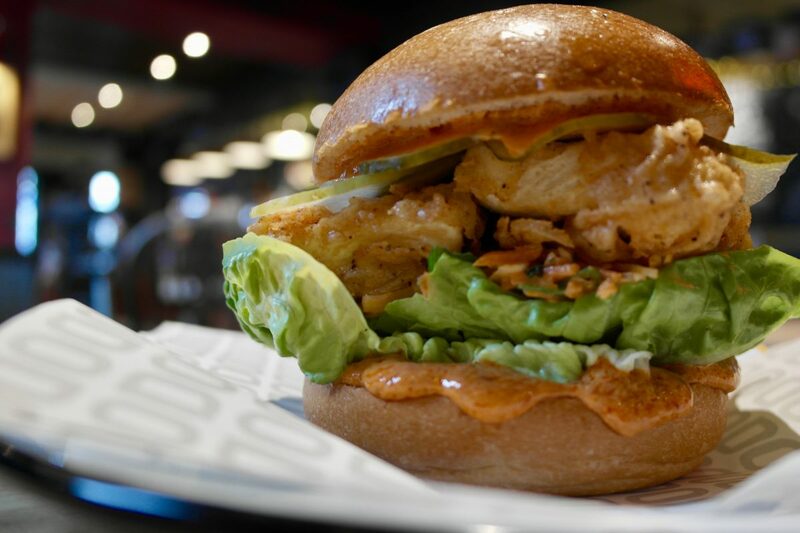 Featuring (I Can’t Believe It’s Not) buttermilk crispy tofu sandwiched between a brioche bun, with vegan chipotle mayonnaise, spicy slaw, pickled cucumber and lettuce, the burger was really tasty and full of flavour, a decent size too. The tofu was great, I much prefer a crispy tofu to balance that silky interior. My only objections being that its crisp exterior dissolved into the sauce as time progressed, and it was a fairly messy burger to eat due to the sauce levels. But honestly, neither bothered me that much. The vegan mayonnaise is oil based and made with chickpeas, but you may not know that from trying, as it tasted every bit as mayonnaisey (yes I’m making up words) in flavour as non-vegan. Second up was the ‘Viva la Vegan’ pizza (£11). Hold my drink. 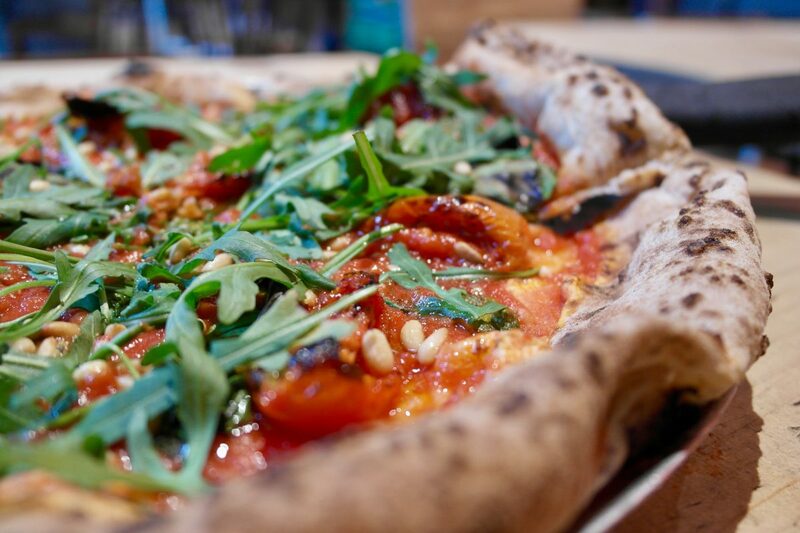 This included a wonderfully soft and chewy sourdough base, topped with a delicious tomato base sauce, basil, pesto Genovese, sundried tomatoes, pine nuts and rocket. I was pretty bloody certain I’d miss these cheese, but no, I’m converted. The stars of the show were the pizza dough and sauce, full of flavour and delicious just on their own. 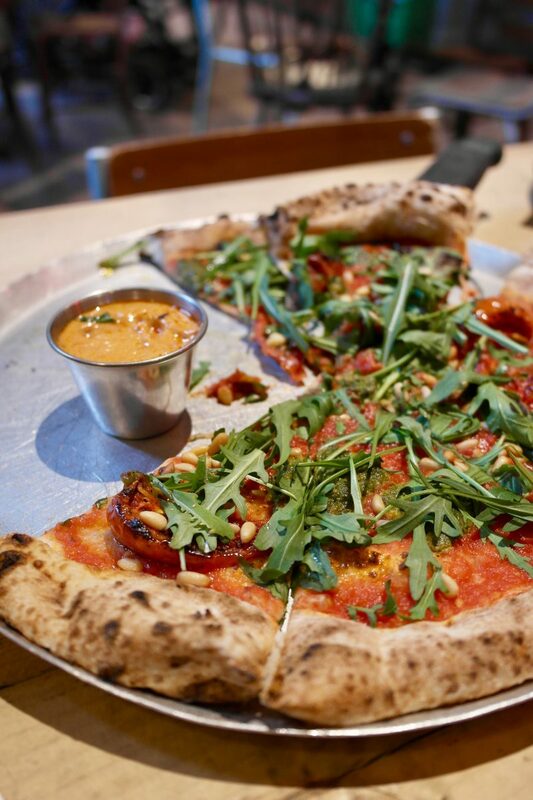 When pizza is this good it doesn’t need messing with. The pine nut added texture and my little slug of Cotswold Gold chilli oil added a punch of warmth to really top it all off. 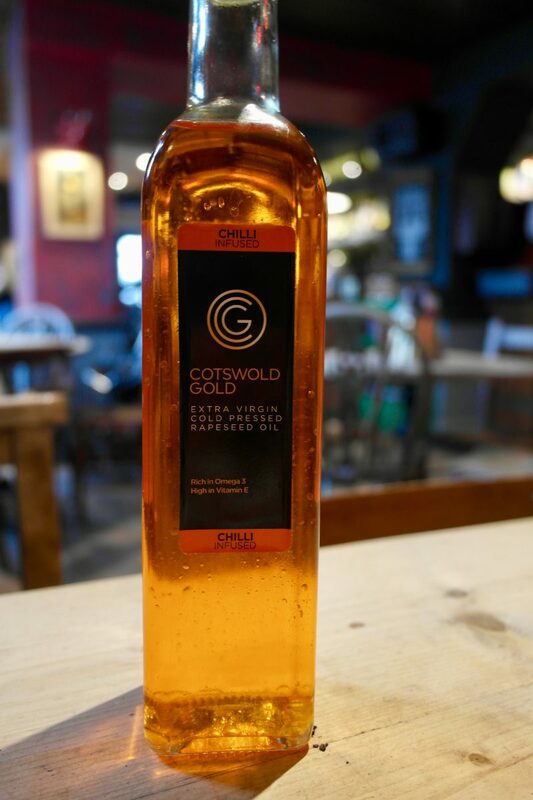 Top tip – the Rusty truffle fries are made with Cotswold Gold truffle oil, so stock up for replicating at home. Or just do what I do, go there and eat them! 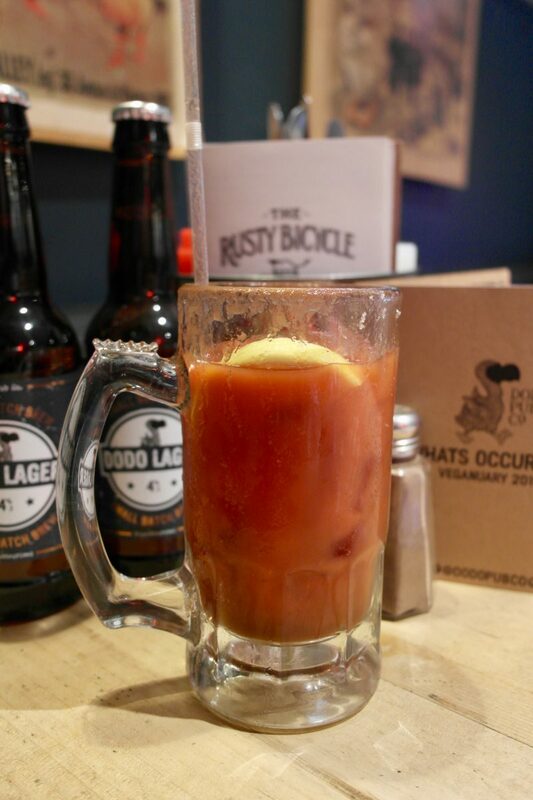 As a bit of a side note too, while I was waiting for the food, I ordered one of my favourites, a Virgin Mary – or spicy tomato juice for the uninitiated. I like a good kick in a VM, so was particularly pleased to be served one with enough spice you could actually taste. I’ve had many a disappointing one, and was even told ‘we don’t serve cocktails here’ when I asked for a spicy tomato juice in one local establishment. So big up the bar staff at the Rusty, they make a mean Virgin Mary. They’ve recently launched a new Dodo bottled lager too, which you can spot behind my drink above. I’ve taken away a couple of bottles to sample – more on that soon. Anyway, I digress. Hugely impressed with both vegan dishes, I’d happily order either again. In fact, I’m back there later this week with the Bitten team and I’ll be ordering ‘Viva la Vegan’! The Rusty Bicycle is quickly confirming itself as one of my favourite local places for food. I can’t remember a time when I’ve visited and been unimpressed with the food. Truffle fries, as previously mentioned, are excellent; burgers are packed full of flavour and well filled; pizzas are – well, arguably some of the best in Oxford, that’s an article for another time! Let us know in the comments section below if you’ve been and how you rate it. Want more vegan? Check out our guide to the best vegan food in Oxford, and read our Winter Guide full of the best Veganuary offerings.